Here are some quick, easy actions you can take in the next week to help move forward key issues like enacting paid family and medical insurance and stopping transgender non-discrimination. Thank you! On April 19, the Senate Finance Committee voted along party lines to send HB 628 to interim study—effectively killing the bill. This was shortly after a letter from Gov. Chris Sununu saying he planned to veto the legislation. After three years of research, 18 months of bipartisan collaboration, and three separate votes to pass the bill in the House, Gov. Sununu and the Senate are working derail this popular proposal. It’s important that your State Senator and the Governor hear from disappointed voters who overwhelmingly support implementation of a paid family and medical leave insurance program for working families. The entire Senate will be voting on the bill soon. Please call today! Call Gov. 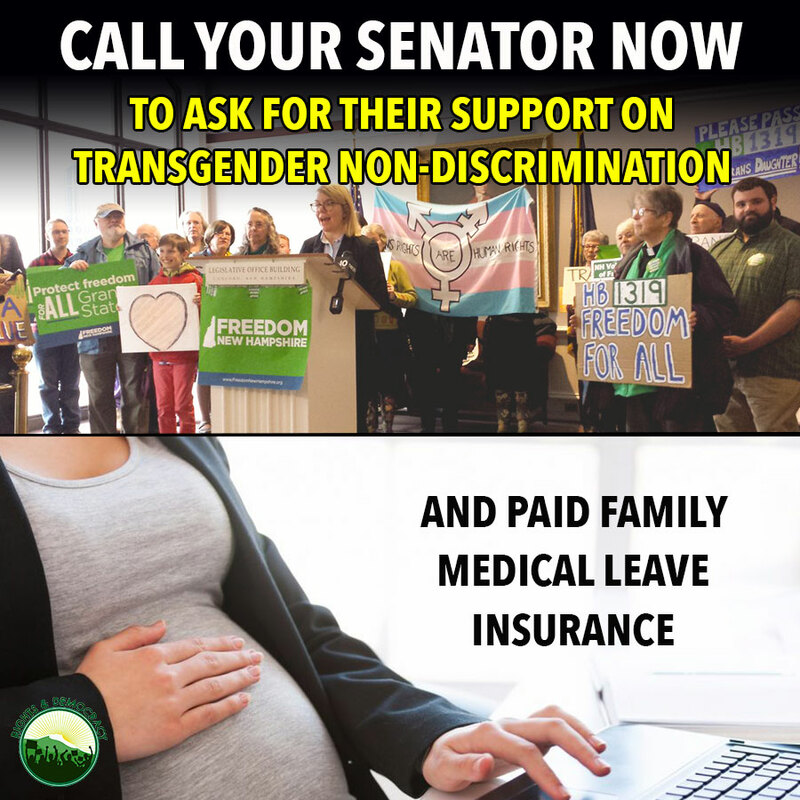 Sununu’s office at 603-271-2121 and let him know you expect him to stand by his campaign promise to support paid family and medical leave in New Hampshire. Hello this message is for Governor Sununu, my name is ___________. I live in _______________ and I’m calling about the Family and Medical Leave bill, House Bill 628. I am very disappointed to hear that you are in opposition to this bill that would greatly benefit New Hampshire families such as my own. I was so pleased when you voiced your support for the policy in the past and am frustrated to hear you are now working in opposition to this popular program. Working families in our state need family and medical leave and I urge you to work with the Senate to advance this important policy. Today, HB 1319 advanced to the full Senate, though without an endorsement from the Senate Judiciary Committee. Instead, the Committee recommended HB 1319 by a 3-2 vote for interim study—essentially a polite way to try and kill the bill. An interim study committee takes no clear action on a bill, and its recommendations are not required to be acted on. The bill still gets a vote on the Senate floor, and momentum is high. That vote could come either this Thursday, or next Wednesday or Thursday (May 2nd or 3rd) during the final days of the Senate session. Contact your senator and urge them to vote in favor of HB 1319. We don’t need more time to know discrimination is a problem and this non-discrimination bill is the right solution.